For many years Ocracoke was home to very few mammals. The most noticeable, of course, were human beings. We did have wild horses, quite a few feral cats, nutria, rats & mice, some minks, eventually squirrels, now raccoons, and an occasional bear that would swim over from the mainland. About 15 or so years ago islanders began reporting deer on the island. I occasionally noticed deer tracks in the National Park, and on one early morning drive to the Hatteras ferry a doe and her fawn bounded across the road in front of my car. I hadn't noticed evidence of deer, or heard about any sightings, for quite a while. I thought they had vanished. So, on a recent walk in the Park I was intrigued to see numerous deer tracks "down below" (this is anywhere from the edge of the village to Hatteras Inlet). I was not too far from the Pony Pen when I spotted the tracks. Let me know if any of you have seen deer on the island recently. Mark your calendars for this Saturday December 1st. The Ocracoke United Methodist Women will be holding a Christmas Market at the Methodist Church Rec Hall. Silent auction and craft sale start at 10 a.m.
A special treat this year will be a delicious lunch of shrimp burgers and clam chowder starting at 11 a.m. Hot dogs & baked goods will also be offered. 10% of the Market's proceeds will be donated to UMCOR (The United Methodist Committee on Relief) for Hurricane Sandy relief efforts. You can stop by the Church Rec Hall Friday evening between 4 and 6 p.m. to preview auction items. A list of auction items can be found here: http://www.ocracokecurrent.com/50049. The winter beach is more likely to yield seashells than the summer beach. Late summer and fall hurricanes and storms stir up the sea floor, and fewer people are walking on the beach, especially on cold and blustery days. Not long ago I stumbled upon two nice olive shells while walking along the beach. I wasn't even looking for them...just out taking a brisk walk. But of course I stopped to pick them up. If you are on the island this time of year, keep your eyes open for treasures from the sea. I've located another vintage Ocracoke video. I was chatting with Melissa Garrish Sharber at the post office a few days ago and she alerted me to a YouTube video of the 1990 July 4th entertainment at the Ocracoke Preservation Museum. The "sailors" from the local musical "A Tale of Blackbeard" were performing one of their favorite numbers, "Ocracoke Cutie." Danny Garrish, Melissa's daddy, and one of the funniest and most delightful people I've ever known, has the lead (he played the ship's cook). My son Stefen played the lead romantic role and sings the duet with Danny. Here is the link: http://www.youtube.com/watch?v=4_OJKwfUGK8. If you remember "A Tale of Blackbeard," Danny, Stefen, or any of the other actors, leave a comment with your recollections. I hope you enjoy the video. A few days before Thanksgiving I noticed these lovely winter roses blooming in my front yard. Maybe they are a sign that winter won't be too severe. I was volunteering at the Community Square Market two days ago..."Black Friday." My grandson, Eakin, was visiting from his home in the mountains of North Carolina. About an hour after we opened the market we had five people quietly looking at merchandise. Eakin leaned over and whispered to me, "It's the Black Friday rush!" Business picked up as the day progressed, and we at Village Craftsmen had a burst of business in spite of recent problems with NC Highway 12. Of course, everything will slow down again now that the Thanksgiving holidays are over. But don't forget that Village Craftsmen has a large selection of hand made American crafts that are just perfect for holiday gift giving. Visit our on-line catalog (http://www.villagecraftsmen.com/catalog.htm) to see a selection of our pottery, glassware, jewelry, musical instruments, and much more. Our quality American handcrafts are bound to please almost anyone on your Christmas gift list. I was wrong. I thought there would be a smaller crowd for this year's Festival Fundraising Concert. After all, the road on Hatteras Island is still closed periodically, even for four-wheel-drive vehicles. And yesterday morning, because of fog, none of the ferries were running. But last night the Community Center was packed with enthusiastic Ocracoke residents and visitors. And no one was disappointed. As usual, talented island musicians entertained the crowd with rousing jazz numbers, thoughtful original tunes, and traditional local ballads. There were even two popular sing-alongs -- "Avast" from the musical A Tale of Blackbeard, and "You Are My Sunshine." In addition, Captain Rob Temple told a new Thanksgiving poem he wrote recently, Donald Davis shared a new story, and I told the story of the 1889 wreck of the steamboat Pioneer. As they say, a fun night was had by all! As I mentioned two days ago, today is "National Day of Listening." "The National Day of Listening is a day to honor a loved one through listening. It's the least expensive but most meaningful gift you can give this holiday season. You can choose to record a story with anyone you know. Learn more here." Wishing all of you a wonderful day of offering thanks for our many blessings. And a special, hearty "Thank You" to all of our faithful readers. We hope you enjoy the fruits of this bounteous land, share a portion with others, and celebrate this day with family and friends. "The National Day of Listening is a day to honor a loved one through listening. It's the least expensive but most meaningful gift you can give this holiday season. You can choose to record a story with anyone you know. This year, StoryCorps has chosen to feature the stories of veterans, active duty military, and their families. Learn more." We have just published our latest Ocracoke Newsletter, the story of the day Charles Lindbergh landed on Ocracoke Island. You can read it here: http://www.villagecraftsmen.com/news112112.htm. For the latest official information about the NC Highway 12 recovery effort, please visit the NCDOT website: http://www.ncdot.gov/travel/nc12recovery/. Yesterday, in response to the 1965 home movie of a trip to Ocracoke, a reader asked, "Is there one key moment that catapulted OI into a mecca for tourists...?" Perhaps we should begin with this statement about Ocracoke Island: "[T]his healthy spot is in autumn the resort of many of the inhabitants of the main[land]." This "Description of Occacock Inlet," accompanied Jonathan Price's map of 1795! Next we should mention the old Ponzer Hotel which was built in 1885, and was located where the US Coast Guard Station/NCCAT campus is today. 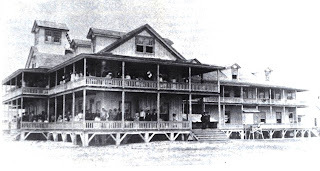 The hotel, which catered to wealthy North Carolinians who traveled to the island by steamship, burned down in 1900. The following photo, taken in 1898 speaks for itself. Of course, modern-era tourism received a major boost in the late 1950s from the building of roads and the beginning of ferry service to Ocracoke Island. To be sure, various islanders (Stanley Wahab comes to mind) and others saw the continued economic potential of Ocracoke as a tourist destination. The rest, as they say, is history. Another question was, "is there a higher percentage of rental income properties owned by non residents vs local resident population landlords?" I don't have any official figures but I am certain the answer is yes. Our latest Ocracoke Newsletter is the story of Ocracoke and the War of 1812. You can read it here: http://www.villagecraftsmen.com/news102112.htm. A few days ago Leroy O'Neal's daughter Kathi sent me a link to a six minute Ocracoke video that her cousin recently uploaded to YouTube. Leroy made the video in 1965 while on a fishing trip to the island (although born on Ocracoke, Leroy moved away when he was a young boy). Here is the link: http://www.youtube.com/watch?v=ukxHq2MnpoA. Several minutes of the video are simply Leroy's friends fishing and carrying on with a shark they caught, but there are a few noteworthy segments. Pay attention to scenes of Silver Lake harbor and note all of the traditional wooden skiffs tied to stakes (not at docks). Also notice just a few vehicle tracks on the beach, and no other trucks in sight! Native islander, Murray Spencer (father of William Nathan who works at the "dump"), is the man with gray hair, sunglasses, and a small mustache. You will also see the Pony Island Restaurant and Motel...and enjoy the music of two O'cockers, Jule Garrish & Martin Garrish. Wallace Spencer (1912-2001) was a wonderful old-time Ocracoke character. One Sunday morning I heard him say, "I've got a mind to go to church today." Then on reflection he added, "but I've two minds to go fishin'." Yesterday a reader asked, "would you venture to put into words an Ocracoke perspective on the matter [of maritime salvage]?" In 1750 colonial Governor Johnson described Outer Bankers as "a set of indigent desperate outlaws and vagabonds." It has been said that an Ocracoker would drop a corpse on the way to the graveyard if someone yelled "Ship Ashore!" Recently a reader asked this question: "To the point of beachcombing, metal detectors are not permitted anywhere on the ocean beaches of Ocracoke, are they?" The answer is no. Metal detectors are prohibited in all US National Parks. A related question was: "Separately, aside from the stories of salvaged cargo from wrecks over the years, any anecdotes you have to share (yours or from others) re. particularly noteworthy beach finds?" I have heard or seen evidence of the following being found on the beach within the last 100 or so years: hundreds of bunches of bananas, top hats, gold coins, Indian arrowheads, dozens of shoes (originally destined for Jim Jones' People's Temple in Guyana), fruits and vegetables (apples, onions, and oranges), and thousands of bags of Doritos in 2006 (http://hamptonroads.com/node/189201). Re. the mailboat Aleta: a reader recently asked, "Before and after the period you mention for the Aleta,1940s - early 1950s, how did mail and people get to the island? What kind of boat and from what port?" A full answer to this question will require more than a few sentences, so I will just give several brief comments today. I will write a lengthier history of the US Postal Service on Ocracoke for an upcoming monthly Ocracoke Newsletter. Look for that article in the next few months. The Ocracoke Post Office was established in 1840. Prior to that time letters were carried to and from the island by family and friends, or by entrusting them to ship captains.The first "mail boats" were probably "bugeyes" (two masted sailboats) that also carried passengers and freight. By the early 1900s mail was carried back and forth across Pamlico Sound (from Beaufort, and later from Atlantic, North Carolina) on motor powered mail boats. These included the Meteor, the Hero, the Viola, the Lillian, The Kitty Watts and the Ripple. The Aleta carried mail and passengers from 1938 to 1952. The Dolphin was Ocracoke's last mail boat. It operated until 1964, although mail also came by way of Hatteras soon after Frazier Peele established a private ferry service across Hatteras Inlet in 1950. Charles McWilliams (Charlie Mac) drove the mail truck (a WWII era Dodge Power Wagon) to the north end of Ocracoke (either on the hard beach at low tide, or on a deeply rutted sand road farther back) for a number of years. Today mail is still delivered to Ocracoke across Hatteras Inlet. On October 22, 1878, the schooner Altoona wrecked at Cape Hatteras.All seven crew members were rescued along with some of her cargo. In 1962 or 1963 the hull of the Altoona was uncovered and became a tourist attraction. The Outer Banks Chamber of Commerce web site, http://www.outerbankschamber.com/main/directions-to-visible-shipwrecks-obx/, provides directions to locate the remains of the Altoona plus six other visible wrecks on the Outer Banks, including one on Ocracoke. Since tomorrow is Robert Lewis Stevenson's birthday and the day in 1750 that treasure stolen from ships anchored at Ocracoke was buried in the Carribean, John Amrhein, author of Treasure Island: The Untold Story has declared November 13th to be Treasure Island Day. I haven't had much time to get to the beach, but I have found a few nice shells each time I've been there. Scotch bonnets are the North Carolina state shell and one of my favorites. Here is a picture of some of the shells I've come home with. The mailboat Aleta carried mail and passengers to & from Ocracoke in the 1940s and early 1950s (see http://www.villagecraftsmen.com/news052007.htm for more information). The "mailboat" was a variation of the shad boat, a type of vessel first built by George Washington Creef on Roanoke Island in the late 1800s. The shad boat (with wide beam, round stern, and graceful lines) evolved from dugout log boats. It was ideally suited for fishing in rough water near inlets and in Pamlico Sound. The North Carolina General Assembly passed a bill in 1987 designating the shad boat the "State Boat of North Carolina."" 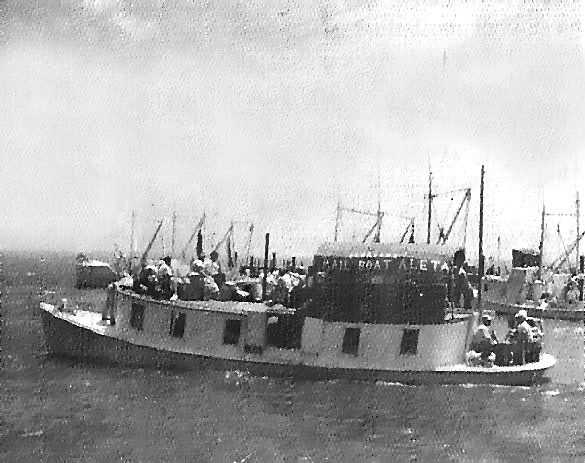 According to Michael B. Alford in his book, Traditional Work Boats of North Carolina, "during Prohibition times shad boat builders found a lucrative business in supplying boats to dealers in illegal alcoholic beverages...." These boats were "euphemistically referred to as mail boats," and "for obvious reasons they usually were furnished with more powerful engines than their fishing cousins." The Harker's Island story of the misadventures of the Adventure, a prohibition era rum runner, is told in the song "The Booze Yacht" (sung to the tune of "The Sidewalks of New York"). I'm not sure if the Adventure was a "mailboat" but this fun song is still popular on the coast of North Carolina. Every night and morning the fishermen would meet. This way, that way, to the Cape they’d run. The coming of the Adventure, put the fishing on the bum. When the Booze Yacht run ashore. Times have changed since those days. 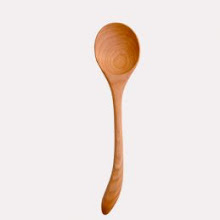 When some were up in their “Gs”. Others, they are down and out, but most feel just like me. This morning at 9 am Ocracoke students and staff will hold their annual Veterans Day Celebration at the flag pole in front of the school. Everyone is welcome to attend. A light breakfast will be served to all veterans immediately following the ceremony. We join with the Ocracoke School and other members of our community, state, and nation in honoring our veterans. The Hyde County unofficial election results were released yesterday about 1 pm. Frankly, I found the information a tad confusing*. There were also a number of Hyde County absentee votes, but these were not listed by precinct. All told, Hyde County cast 1157 votes for Obama (Democrat), 1183 votes for Romney (Republican), and 15 votes for Johnson (Libertarian). Goode received no votes in Hyde County. You can read the entire list of results here: http://hydecountync.gov/docs/Hyde_unofficial_results.pdf. * For example, one category was listed as "Presidential Preference (DEM)" (the choices were O'Bama [sic]/Biden, Romney/Ryan, Johnson/Gray, & Virgil Goode) and another category was "Straight Party" (the sub-categories were Democratic, Republican, & Libertarian). I couldn't tell if the "Presidential Preference" category (Why was "DEM" in parentheses?? There was no "REP" counterpart.) also included the "Straight Party" numbers or not (I am guessing they did). Traditional island skiffs were often flat bottom boats.These wooden boats were typically built upside down, with the bottom planks added last. The bottom planks ran from side to side, not from bow to stern. These boats were simple to construct, and could be built economically in just a few days. They were suitable for the calmer and shallower waters of Pamlico Sound. A deadrise boat is better suited for rougher water. The deadrise boat is v-shaped in cross-section. Typically the forward section of the deadrise skiff is more sharply v-shaped, and the stern area much flatter. Bottom planks of a deadrise boat are laid fore and aft, not side to side. Polls on Ocracoke open today at 6:30 am at the Community Center. They will remain open until 7:30 pm. And don't forget to get your "I voted" sticker to remind your fellow citizens to cast their ballots. As we all know, this will be a close election. When it is over let's all work together for the benefit of our nation no matter who wins. Several days ago a friend read me this passage from a book of local photos and stories: "Ocracoke Harbor is also called Silver Lake. It used to be called Cookie Creek. It got its new name in 1923 when dredging turned it into an almost perfect circle of water..."
The original name of the harbor was "Cockle Creek," not "Cookie Creek." Maybe this was a typo. Also, the harbor was re-named "Silver Lake" when it was dredged around 1938, then again in 1942, not 1923. At least that is my understanding. According to my father, the "creek" as Ocracokers call it, was about the same size as it is today...just much shallower. There were two narrow streams or "guts" that continued all the way to the bald beach. These were filled in when the harbor was dredged in 1942. You may also see signs identifying the Community Store area of the village as "Down Creek." Traditionally this has been called "Around Creek," not "Down Creek." The area near the lighthouse is "Down Point." The "Down Point Decoy Shop" may cause some confusion. It was originally established down point...then moved to its present location around creek. But David O'Neal retained the name. Check it out. David is a master carver and collector of superior carvings. It's a beautiful day on Ocracoke today. The waves are gentle and a crisp breeze is blowing in. It's the perfect day for a walk on the beach. Perhaps I'll even find a few shells. They often wash up on the beach in greater numbers after a storm. If I locate any pretty ones, I'll post a photo. Visitors to Ocracoke often ask us what we do in the winter. One answer is Basketball! The school Middle School and High School girls and boys teams keep us busy cheering and stomping and have a great time. The Varsity Boy's team is hosting a Fish Fry Fund Raiser today (Nov. 3) at SmacNally's from 1 to 4 PM. For $10 a plate you get fish and hush puppies, beans and slaw. And Dune Dogs will be providing live music from 2 to 5. This Saturday Night, Nov. 3, Bland Simpson and Don Dixon will be at the Community Center at 7:30 for a presentation of of their popular Songs and Stories of the Sounds and Seas...with a King Mackerel or Two! The performance will include some special "just for Ocracoke" material. This is a fund raiser for the Community Square Revitalization Project. Tickets are $25. All the ticket proceeds and donations made at the door will go to the Project. Space is limited; get your reservation by calling Merle Davis, 252-928-2587. Come out to the Community Center and celebrate life here between the Sound and the Sea...and help keep the Community Square as a vital part of our village. This is Bill posting. Lida and I moved here five years ago this fall. After spending threes days hunkering down against the visit of Hurricane Sandy, I have two thoughts. First, I can now say without hesitation that my least favorite weather is wind. It howled. It gusted. And my house shook and rocked. And this was not a "passing storm"; it carried on for three days. It is not relaxing to lie in bed and feel the house sway. And at several moments when I was not aware of my house swaying and rocking, and found myself standing over my toilet, I was amazed to see the water sloshing around in the bowl. That's where I actually would like to have seen Jim Cantore: down there shouting up to me about why that was happening! Second thought: About a year ago Lida paid good money for a pair of hip waders. At the time I thought, "What a waste of our money; we already have two good pairs of rubber boots that come up almost to our knees." Then Sunday morning I walked down my front steps in a pair of those babies. The water was within about 2 inches of over topping them and I still had another step to go! At that point I thought "What a smart shopper Lida is!" Ocracoke came through well. Our thoughts are with those who did not.